Until the defeat of the 1715 rising, the Earl Marischal was Chancellor of Marischal College with the power to appoint a number of staff. In 1765, he sent his former baton of office as Earl Marischal to the college 'hoping that they will receive the useless present as still a mark of regard and affection'. Engraving of Simon Fraser, Lord Lovat, by William Hogarth, 25 August 1746. 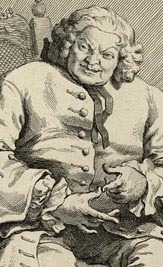 This engraving of Simon Fraser is taken from a live sketch drawing by the famous satirist William Hogarth. In the summer of 1746 Hogarth was allowed to visit Fraser, who was being held prisoner at the White Hart Inn at St Albans just outside London. Fraser was on the final leg of his long journey to the capital to await his trial for treason. Graduates of Aberdeen's two colleges supported opposing sides in the Union controversy. In the 1710s, George Keith, Earl Marischal of Scotland, represented the family that had founded Marischal College. He was also a prominent Jacobite. After the failure of the 1715 rising, Keith fled into exile and entered Prussian service. Robert Paterson, Principal of Marischal, was another Jacobite who nurtured loyalty to the Stuarts through patronage of the local arts and an ambitious refurbishment of the college. King's College also provided a haven for Jacobitism, though some figures associated with the college were less than consistent in their political principles. Simon Fraser of Lovat, who graduated with a MA from King's in 1683, was universally perceived to be an untrustworthy rogue. 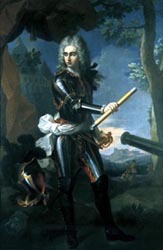 An opportunistic supporter of the Hanoverians in 1715, he sided with the Jacobites in 1745-6. Executed for treason in 1747, aged 80, he was the last person to be publicly beheaded in Britain.